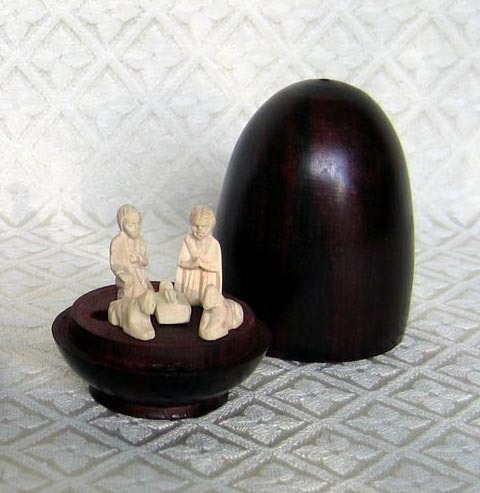 This scene from the island of Madagascar contains a tiny Holy Family and two sheep hidden inside a wooden egg carved from rosewood. The Malagasy people generally carve in a detailed European style (rather than traditional African styles) because these wood carvers learned their carving style from French Jesuit priests. The Holy Family is carved from a precious white wood called Fanazava. The rosewood egg is very hard and contains a natural oil. The egg measures 3.75 inches high. This piece was purchased from a carver named Dada Be (“Grandfather”) in Ambositra, a town in the region of the Betsileo tribe. This town is reputed as the artisan capital of the country, regarded as home of the best Malagasy wood carvings. Several people in the same family will work on each carving. Each person has a specific job: one does a rough outline of the figure; the second person (the best woodworker) does the detailed carving; and then others (often women) will sand, stain, and polish the sculpture.